If you have bought a Mirex tilt-shift adapter or studied my description intently, you may have noticed three holes below the lens mount. As suspected, these holes demonstrate foresightful planning, as they allow the attachment of a tripod mount. Just before we left for our vacation, I have received a small package with an early (not yet anodized) version of this tripod mount. I had therefore the possibility to test this accessory during our holiday and would now like to share my experience with this accessory. Just to make it absolutely clear: What you see in the photographs below is an early version of the tripod mount, which I have received as a gift from Mirex. As far as I understand, the final product will be anodized in black and should be available by now. The tripod mount is firmly attached with three screws that fit into the holes of the tilt-shift adapter. As shown above, the tripod adapter consists of a small piece of aluminum, which is attached to the tilt-shift adapter with three screws. The screws are inserted from the camera proximal side. All screws and an allen key are included and the mount fits perfectly. At the base of the adapter are three threads to either mount a base plate (see below), to directly fix the tripod mount to a tripod, or to attach a quick release plate. 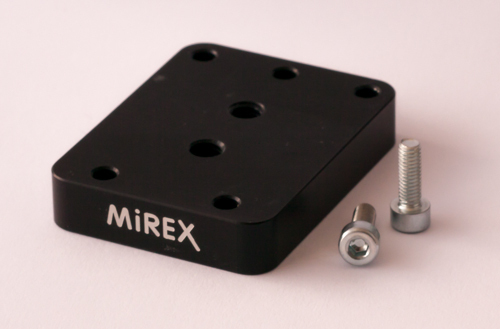 The tripod mount is delivered with a solid base plate, which can be replaced with a quick release plate of your choice (currently not provided by Mirex). Together with the tripod mount itself comes a solid base-plate that attaches to the adapter with two additional screws. This plate features several threads for the attachment to your tripod or quick release plates. I have not used this plate because I find it too big and instead replaced it with a small quick-release plate that allows me to directly attach the tilt-shift adapter with the lens and camera to my tripod head. The tripod mount protrudes on the lens-side of the adapter. The tripod mount protrudes about 4 mm on the lens-side of the tilt-shift adapter. 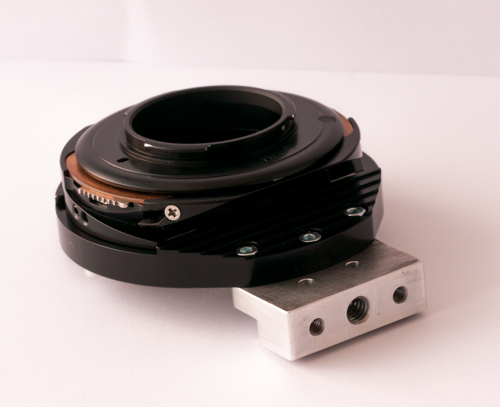 This protrusion may prevent mounting lenses with a large diameter. I was made aware of this problem by Mirex and experienced it with a Nikon to Canon EF mount adapter, which had a larger diameter than necessary. In my case, the problem was easily solved by grinding the barrel of this adapter with sandpaper until it fitted the adapter (and I had three blisters). Instead of the provided base plate I have directly attached a small quick-release plate to the tripod mount. Since I use all my manual lenses exclusively with the Mirex tilt-shift adapter (at least at the moment), irrespective of whether I use the tilt and/or shift function, and also often photograph handheld, I want the setup to be as small and compact as possible. Therefore, I did not use the base plate provided with the adapter, but instead directly attached a small quick release plate. This arrangement worked well for tripod-based photography and did not bother me much while taking manual photographs or when the lens was stored in the bag. 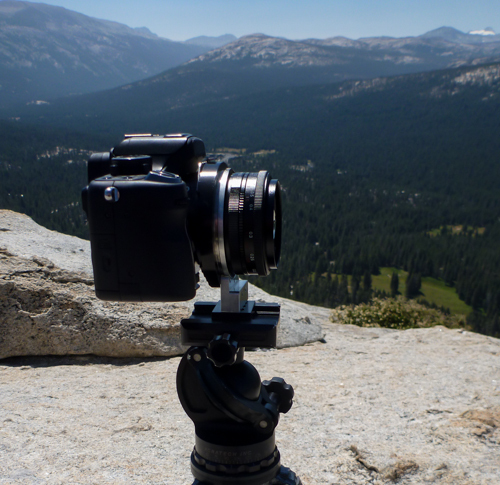 The Mirex m4/3 tilt-shift adapter with tripod mount in action on Lembert Dome in Yosemite National Park. 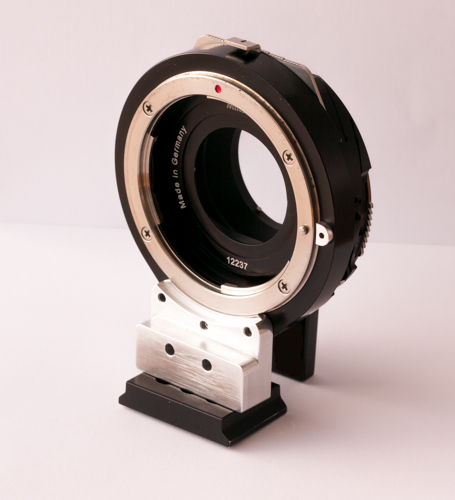 The tripod mount for the Mirex tilt-shift adapter allows to shift (and tilt) the camera, while the lens remains fixed. The camera can be rotated, but the shift movement is only left-right (or up-down if the tilt-shift adapter is mounted vertically, for example with a L-bracket). Irrespective of the tripod mount, the tilt movement is perpendicular to the shift movement (as described in my first tilt-shift blog post). The ability to shift the camera while the lens remains fixed is particularly helpful for taking shift panoramas, which is one of the applications I am most interested in. Attaching the adapter to the tripod head, as opposed to the camera, may also provide a better balance and thus render handling much easier, in particular with heavier lenses and/or small cameras. Despite these advantages, the dedicated tilt-shift lenses I know do not have a tripod mount, which makes the described tilt-shift adapter solution rather unique. I am very happy with both my tilt-shift adapter and with the new tripod mount that I leave permanently attached (I am too lazy to unscrew and fasten the tripod mount each time I want to use the adapter on a tripod). However, if you hardly ever create stitch panoramas you may not need a tripod mount and definitely not want to permanently "enlarge" your tools with this accessory. For me, the tripod mount for my tilt-shift adapter is a worthwhile accessory, which allowed me to take several nice panoramas, some of which I will show you in upcoming posts. Thank you for your two articles on the Mirex. I have been using a Mirex for P645 to Canon EOS camera since earlier this year 2013, and I love the tripod foot, not only for the reasons you explained, but also because we can adjust the focus with tilt, while only barely moving the composition, instead of needing to pitch the composition down dramatically while adjusting the tilt, which would be a serious nuisance. Also, because of the rotation mechanism which is used for the tilt adjustment, the axis of rotation for the tilt is nearly coincident with the center of gravity of the camera. This causes the camera to simply hang there with the tilt not even locked with the finger screw, though the tilt adjustment could be easily moved by accident with a firm touch, as when doing a triple shift stitch. This is quite the opposite of the lens situation, where supporting the entire assembly by the camera causes the lens to exert large downward force on the tilt setting, which the finger screw is only barely able to resist, if at all for a larger lens. And of course this way of doing the tilt keeps the lens axis pointed at the center of the sensor, which is very important in many cases. The Canon 90 TS-E lens very much does not work this way, rather it throws the lens axis off center. I like the Mirex way much better. I like very much what Mirex has chosen to do with the two-part tripod foot assembly. On my adapter, there is simply a taller flat spot on the edge of the adapter, on the lens side, and the foot plate (the bigger of your two pieces) screws directly into the adapter with two screws. There is no intermediate part. But this new way causes there to be enough room between the Arca-Swiss plate for the Mirex and the Arca-Swiss L-plate for the camera (usually from Really Right Stuff). Without that extra room, a clamp could not grab the A-S plate under the Mirex tripod foot, as it would be too near the camera's L-plate to fit. I see you got a ball head from Scott Dordick at Acratech. I use his leveling base under my 3-way Gitzo head, which works very nicely (bigger and heavier tripod head but great for precise work, with 3-way independent, fluid control). I also put an RRS PCL-1 clamp atop the Gitzo head's platform, so I can rotate for pano stitching, either around the vertical axis or around the tilted axis. Both are important at times to obtain the necessary image geometry. I am interested in the Mirex issue again because of the new Sony cameras. To allow tilt and shift of the full-frame sensor without vignetting, they may need to have a somewhat larger opening than used in your T/S adapter. Also, mine doesn't have chrome plated steel or brass for the lens contact surface. That seems to be new. Maybe. Very good products. Very skimpy information on their web site, but they have what we need, which is wonderful, and they are very well made. Markus says today that an adapter for Canon EOS lenses to Sony NEXa is coming, perhaps as soon as late November 2013 (one month). I trust it will accommodate the FE series, Sony A7 and A7R full-frame cameras, but we shall see. Markus suggested it would, as that was what I wrote him about, though some confusion is possible in translation and he did not specifically reaffirm that it would accommodate the new full-frame sensors, i.e. NEX mount but full-frame, FE format, they are calling it. The Canon lenses or adapted Nikkor etc. lenses would not cover for shifting, but the tilt mechanism would work great, assuming the camera's sensor and its microlenses don't break this important option, which they may, if they are like the Sony NEX-7 in that regard. I certainly hope that works too. thank you for visiting my blog. I am also surprised that the m4/3 T/S adapter is not yet listed on the Mirex website, but I am quite sure that it is available. I would send an e-mail to Mirex (info"at"mirex-adapter.de) and I am sure that you will receive a friendly and reply. I have done so and have been quoted a price of 320 Euros, plus another 50E in S+H, making the total a bit painful but acceptable if this is this is indeed a quality product. Hi Florian. Very interesting article! I have an a7 and an Hasselblad lens. With this combo would it be possible to perform a side by side stich (maybe more?) to double the resolution? Thank you for your interest. 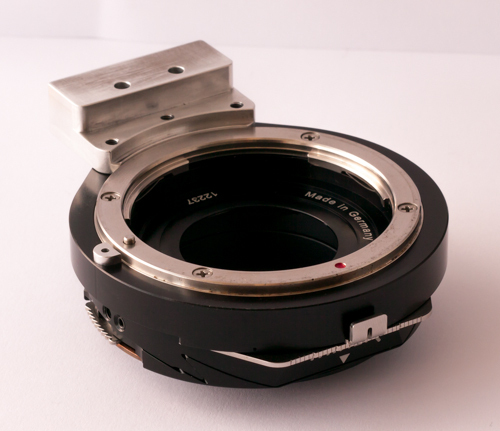 The Mirex adapter can shift 15 mm in both directions (left/right). If you have your camera in portrait format, this should give you a 54 x 36 mm area; slightly more than double the resolution.